Other Products: Smooth White Cardstock, Copper Colored Metallic Cardstock, Zig Markers. Instructions: The ready side-fold card measures, 6" by 8". Cut and layer a piece of copper colored cardstock measuring 5 1/2" by 7 1/2" on the card base. To create the topmost layer, choose a paper from the designer paper collection and cut a piece measuring 5" by 51/2". To the longer edge adhere a half doily cut from the white cardstock using Frame a Card Leafy Borders die. Flowers: Stamp second large and third large images of peonies using archival ink, Plum. 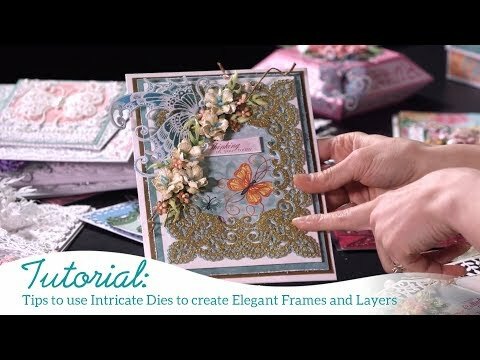 Cut them using their coordinating dies. Color the flower centers with leaf green. Also, color the flower petals with Rose Madder and highlight the edges with Magenta Hue. Also, color the back side of the petals. 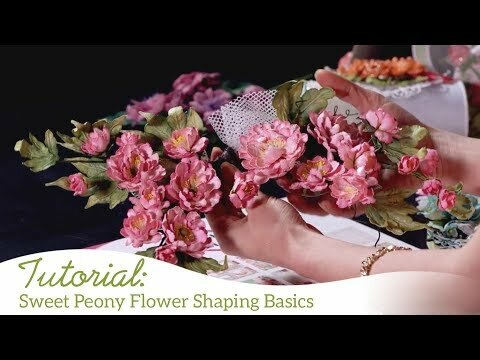 Shape the flowers using Deluxe Flower Shaping Kit. Glue 2 petals each and press the center with a smaller ball tool. Prick a hole in the center and add a bunch of beaded thread stamens. Create 1 big, and 2 small flowers. Leaves: Stamp bunch of leaves from Classic Rose stamp using archival, Library Green and cut the images with the coordinating die. Color them using Leaf Green and Olive Green archival inks. Shape them using Deluxe Flower Shaping Kit. Filler Flowers: For filler flowers, stamp, cut, paint and shape few smallest flowers from Wildwood Floral Collection I have used Magenta Hue and Rose Madder Archival inks to paint these flowers. For Butterflies: Stamp an image from Butterfly Border Stamp set with black archival ink, cut them using it's coordinating die and color the image using Zig Clean Clear Markers. Cut and separate all the butterflies and adhere them as shown. Create a bouquet of flowers and complete the card by adding a sentiment from Heartfelt Love Sentiment Stamp Set.